PlayThisGuy.com is the first service that aggregates and analyzes fantasy football advice from popular sites around the Web. The goal: Turn the experts aggregated advice into a "wisdom of the crowd" perspective so it's easier for fantasy football players to make intelligent decisions. Below, PTG's Ron Ross decribes how his team scores big with Highrise. I run a successful fantasy football site and am always on the lookout for ways to create more time for marketing. After analyzing our needs in the off-season we realized that our CRM was taking too long to complete routine tasks and in aggregate was costing us a lot of time. In addition, we used maybe 20% of what the system had to offer. So, we started looking around and had familiarity with 37signals products from our use of Basecamp and decided to give Highrise a try. Within a week we knew that Highrise was perfect for us. It provided the functionality we needed and not the 80% we didn't. It saves us considerable time entering new prospects, managing relationships, and reaching out to users and partners. Sticking with the principal that 80% of marketing results come from 20% of activity we have found 2 key elements of Highrise essential to the success of our marketing efforts. 1) Tagging - Highrise allows us to quickly and easily manage our contacts using tags. While tags are nothing new or unique, it's how easy these tags are to manage that makes this function so helpful. 2) Exporting - We stay in touch with our users and partners frequently. Highrise makes it dead simple to export a select group of contacts and integrate with 3rd party email systems like MailChimp (our choice). The result is more communication to our community and higher traffic to our Web site. At the end of the day, Highrise has created more time for us to market which is critical to our success. We help aspiring business owners — mostly immigrants and low-income individuals — get started. We teach them how to manage cash flow, find customers and set their businesses up right. We also offer small loans to help them buy things like hot dog carts, new truck tires and sewing machines. Since starting the company in 2008, we've served more than 150 clients through our business training, lending and consulting services. We now have offices in two New Jersey cities — New Brunswick and Orange — but we began as a rag-tag bunch of college students, borrowing space and building contacts as we grew. We got where we are now through lots of work, a little luck, and 37signals. Getting the word out was our first step. In the beginning, we met with community leaders, church pastors and potential funders on what seemed like a daily basis. Lacking an office, a staff, or even a file cabinet, we leaned on Highrise to help us manage our new relationships. Now, we use Campfire to keep in touch at the office, Highrise to keep up with clients and Backpack to track tasks and commitments. Oct. 2010: Tamara enrolls in our business training course. Along the way, we keep tabs on certain goals: is she grasping the material? Is she writing her business plan? Is she gaining confidence in her abilities? The instructor makes weekly Highrise notes that help our team understand how Tamara is doing. Dec. 2010: Having graduated, Tamara seeks a small loan to purchase a sewing machine. Her financials are in order, but our loan committee wonders about how responsible she is. They check her Highrise file and read her instructor's notes: turns out she came to every class on time and did great work. They approve her loan. Feb. 2011: Things are going well, and we meet with Tamara to help her set business milestones: she wants to design a new handbag line, find 10 new customers and purchase a domain name. Six weeks later, our team member Pasquale invites Tamara to the office for another meeting. He doesn't know her too well, but he can get up to speed in seconds by checking her Highrise file. He learns exactly how much progress she's made since joining us, and he makes sure to ask her about the goals she set last time. Tamara's new handbag line is a hit. She's selling a ton of them online, and she easily repays her Intersect Fund loan. Our role was to understand the obstacles she faced and nudge her toward manageable goals. If we merely offered microloans and business training, we would be a decent nonprofit. But our ambitions are higher: we want to be the trusted ally of those seeking success in the face of adversity. This means actually knowing our clients — their difficulties, their needs, and where they want to go. 37signals lets us build the tight connections that enable us to make a real impact. We use Highrise extensively in the day to day running of our business, and can't recommend it enough. We are Northern Ireland's largest property portal, and currently service over 675 customers across Ireland using Highrise. Not only do we use it as our contact management solution, but we also find that its brilliant for handling task management internally. Each member of staff currently has their own login, and uses it to schedule their work for the week (relating to a customer). One major benefit of this is that, at any one time, all our staff, including sales people on the ground - are able to keep track of what work has been completed for individual customers (using the iPhone and iPad application) - and make us appear really switched on when we walk through their doors. Estate agents, being extremely busy, really appreciate when we are preprepared before going through their doors to solve any issues they may have. We've also benefited immensely from the 'Deals' section within Highrise, which allows us to quickly see how much potentially we have coming in at a glance, and to keep track of prices we've quoted, and work that has won or lost. This of course lets everyone in the office, and at multiple sites, know exactly where we are with new and potential customers. Each sales person is also 'assigned' a deal, allowing us to see workload for each, and notes made on visits. Email integration is also inspired, and all of our current dialog is BCC to a Highrise 'Dropbox' - allowing us to attach all conversations which occur with the associated customer. One of the main benefits of this again, is communication with the team, as enquiries which occur from customers are logged, and filtered through to the people that matter on the ground - so they are 'one step ahead' of what is happening internally in the office. We've also recently found that Highrise saves us time, when staff are off on annual leave, or sick leave. With the conversations available, and logged, getting back up to speed with what is going on, is that much easier. If you are managing a team of any size, and enjoy using software which is faster, cleaner, and easier to use than the alternatives. Highrise is for you. We have without a doubt won new business as a result of using Highrise, and would personally put or seal of approval on it. We simply don't recommend any other solution to our other contacts in the industry. Timbuktoons is an animation and design studio in Augusta, GA that specializes in 2D animation, motion graphics and illustration services from concept to delivery for both the commercial and non-profits industries. We are currently developing our own animated children’s shows for broadcast. We’re a small company that thinks big and prides itself on being nimble and efficient. Often we have many projects at different stages in our pipeline at the same time. From the beginning we knew we needed a flexible project management system and CRM that could scale up or down easily depending on the number of employees and workload. Basecamp has helped us streamline our animation production pipeline whether working with in-house employees our off-site contractors. With Project and To-do templates we can quickly start tracking time based on the different roles of our pipeline (visual development, sketching, storyboards, animatics, ink and paint, scene production, etc.). This has been critical for us to predict realistic goals for turnaround times and budget. At just a glance I can get a sense of how the project is progressing and where we are on time and budget. When a job is completed we use the time data collected to accurately give estimates on new jobs…it’s great to have real world stats instead of just bidding in the dark! Highrise has been a great CRM for keeping track of our clients and executives in the world of animation. Childrens’ animation is a fast paced industry but often slow in communication, so knowing who from our company has had contact with someone and what was said helps us stay on top of things without bugging. Plus not having to use folders to archive emails (only to never find them again) is worth the price alone! We've loved the collection of 37signals tools so much that we use them in our personal lives too. I use Backpack for keeping track of my home life and work I do for a non-profit. Wherever we go, we tell people about how we use your products just to see their eyes light up when they see a solution for their own workflow issues. I work for a start-up company called WebGreek, and we make a living selling websites to fraternities and sororities, as well as providing a suite of online tools for chapters to stay organized. We launched our main platform earlier this year (St. Patty’s day to be precise), and since then we’ve been able to sign a national contract, deploy dozens of websites, and bring on thousands of users. We meet a lot of people through fraternity and sorority conventions, as well as through our social media efforts. We need to be able to stay on top of every conversation, because we see our customers as more like friends and partners than clients. In this tightly networked market, where developing a relationship with the customer over a long period of time is paramount, we need to have the history of our relationship with any given contact at our fingertips. As we started gathering contacts from our first big trade show earlier this year, I started looking into CRM programs that we could use to track leads, contacts, and customer service requests. We’d been on another CRM tool for a while, but after one big import, we pretty much stopped using it. There were too many fields, too many modules, and the system wasn’t as flexible as we needed it. After a week of frustration, a friend in a similar situation suggested I explore Highrise. At first, to be honest, I wasn’t impressed. There seemed to be a dearth of features. After playing with the Free version for a few days, I realized that I’d found the platform that we’d be trusting our startup hopes and dreams to. We soon upgraded to Plus. The single best part of Highrise, as far as I’m concerned, is the simple and flexible way that the modules interact with each other. Anyone can add a note to a contact, case or deal, and then add a follow-up task to it if necessary. Just about anything can be attached to anything else, which allows us to come up with our own set of guidelines for using the platform that mimics the way we handle our customer relationships. We are constantly discovering new little tricks and hacks that make tracking our sales and customer service activities that much easier. Our method of using Highrise has evolved quite organically from the start, and it has always been fluid and effective. As far as specific features go, we love the email dropbox. The ability to add a BCC to an email and have it automatically track the conversation means that we actually do it. Copy/pasting the text of an email to a contact adds another tedious step that is easy to forget, and all it takes for us to lose a big sale is one foolish email to a fraternity executive. The Dashboard provides a quick glance so that the whole team (all four of us!) can stay up to date on what’s been happening with our various sales leads. It also helps us keep track of customer service requests, as we can simply add a note to a customer’s contact profile after responding to their issue. Spenser Tang-Smith: "Our core team at our first big trade show, when we realized it was time to start tracking all of our customer interactions." We are in a small, competitive market, and the biggest single offering that distinguishes us from the competition is our stellar attention to customer relationships. In a market full of freemium offerings, we’ve established ourselves as a premium product that is worth paying for. We do so by providing a better customer experience, and part of that experience is the level of personalized attention we give to our members. Without Highrise, attaining that level of service would be impossible. Below: Q&A with Gary Tripp, President of Inside Hospitality, about how his team uses Highrise. What does your company/business do? Inside Hospitality works with restaurant & hospitality organizations in all 50 states and in 30+ countries helping them deliver a better guest experience through focused mystery shopping, online reputation management, coaching, and other experience measurement solutions. Why do you need Highrise? At Inside Hospitality we talk to a lot of restaurant, hotels and bars on a daily basis and have been on a mission (obsession actually) of sorts for the last few years to find the perfect CRM. Every business needs to keep track of contacts, leads, deals, and who said what to whom. The problem is most CRM programs just don’t work. Well, they don’t work in the way we need them to. We have used everything on the market from Salesforce to Goldmine and other fly by night CRM solutions that have popped up on our radar over the years. Most are over bloated with features that may be useful for Boeing or some other Fortune 500 company, but they are totally over kill for us. What happened when we used the before mentioned solutions? They simply weren’t used. Complicated applications don’t get used. Simple solutions that just “work” will always be our choice and are embraced by everyone within our company. We have employees in 6 states and 4 countries. We need something that just “works” the way we need it to. No more, no less. We found Highrise about 6 months ago and never looked back. 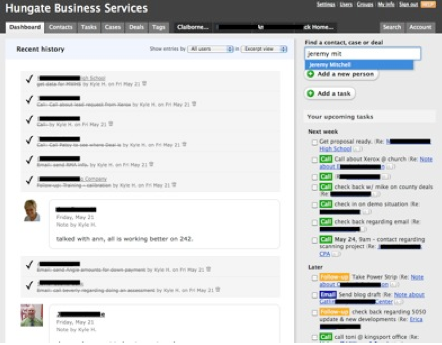 Finally, a CRM that just works the way we do and totally fits our needs. It’s like 37Signals tailor designed this application for us. What luck! How do you use Highrise and why do you like it? Highrise is our daily life line and keeps everyone in the company on the same page. It lets everyone know instantly what was said last, to whom and what needs to happen next. We also love how all the company’s information as well as all contacts are all on the same page. Seriously, how could things be easier? We use the contact search constantly. How many times do you remember the first name of someone but draw a blank on the last? What did you use before and why did you switch? We have tried everything. Most of them are good programs, but are way too over thought on the feature side. We just needed something that meets our needs, with our unique business. How do you use Highrise? As soon as a call (or lead) comes in, we immediately create a Highrise contact and use the “Tag” feature to assign it to the appropriate department/ person for follow up. The dashboard brings it all together in a simple to use way and in understandable terms. It allows everyone to get a snapshot of what’s happening with each and every client touch point. Any tips or tricks for other customers? Managing your client relationships shouldn’t be difficult. Business is all about fostering and building relationships. Don’t make it difficult with over complicated software. Our primary goal is to build relationships with each and every one of our client partners, and Highrise helps us do just that. 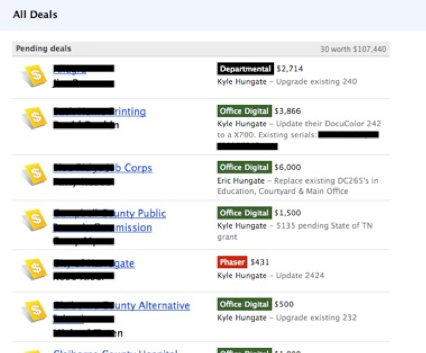 Joshua M. Barrett, an attorney at Black Helterline in Portland, sent us an email detailing how he uses Highrise as a biz dev and marketing tool and Backpack to manage to-dos. I use Highrise as my business development / marketing tool. Existing clients, potential clients, referral sources, etc. are all contacts in Highrise. I bcc: my email correspondence with these people to Highrise so I can keep track of my discussions with them. I use tasks to schedule follow up items so I maintain consistent contact with the people that matter most to my business development efforts. I also add important dates like first met and a periodic check-in dates which automatically trigger tasks. I use the 37signals Highrise app on my iPhone to manage these relationships on the go. I use Backpack to manage my to-dos. I use a GTD methodology and use different pages for different contexts. For collaborative projects, I’ll create a separate backpack page and share it with other participants to make sure we are all working together. I write a blog about use of the iPad in the legal profession, tabletlegal.com. I use a separate page to capture post ideas, text snippets, blog to-dos and the like. I use Satchel for the iPhone and iPad to manage my to-do items and pages while on the go. Powerful but lightweight, cost-effective and easy to use products. Thanks, guys. Dave Brazzle of the Immanuel Lutheran Church in Palatine, IL explains how the church and school uses Highrise and Backpack. At our church, we have 13 Elders. Our elders are closely allied with our Pastor in doing ministry and keeping in contact with our members. Each of the Elders are assigned a subset of our membership, to whom they are responsible for keeping in touch, forming relationships and gathering feedback for the leadership. Reaching for such a goal requires an organized approach that fosters continuity, visibility, discipline and self-accountability. In searching for a viable solution, we had many requirements, not the least of which were security, confidentiality, reliability, remote-access, ease-of-use and many functional requirements. We finally stumbled upon the perfect solution; Highrise. We securely exported our church’s ACS database (a commonly used church database), processed and formatted the data using a custom–designed Excel spreadsheet, and then uploaded the resulting contacts into Highrise. Of critical significance, this spreadsheet allowed us to capture and maintain contact information, including birthdays, anniversaries, email addresses, phone numbers etc, from our church database, and automatically include them in the Highrises’ Background Information frame for each contact! We now have the ability to securely and responsibly maintain and (when appropriate) share our contact conversations. Higrise’s permissions features allow us to control access, limit visibility and protect confidentiality, as context requires. We have begun using Highrise’s “Tasks” feature to contact members on their birthdays, wedding anniversaries, baptismal anniversaries and on the anniversaries of the death of loved ones. Tasks are also used to schedule periodic “maintenance” contacts or to schedule special follow-up contacts as appropriate. It all works perfectly. But wait, there’s more! We also are very heavy users of 37signals’ Backpack. Here, our problem was that we had dozens of ministries operating within the church and school. All of them had a need to communicate their missions, goals, resource needs, accomplishments, pictures, how to join in their ministry, etc. Yet few (well, OK one) of them were web-savvy enough to do anything about it. Although we have a Director of Technology on staff, his time is always in very heavy demand. The time required for dozens of ministries to each explain what they want to communicate on our church/school website(s) would be overwhelming. All of these ministries knew what they want to say, but they didn’t have a good, efficient and timely way of saying it. The answer turned out to be Backpack. We now have dozens of pages, each one of them is literally “owned” by a ministry, a board, or a teacher in our school. It takes only a couple of hours to show them how to use Backpack... even for people who initially tell you that they “don’t do computers.” Many of them report that they have found their “page” empowering. Updates to these ministry pages occur daily, without consuming even a minute of our church’s staff. Each of the ministry Backpack pages, are transparently linked-to and accessed from our church’s main website page. People clicking on these links, scarcely even know that they have left our “normal” web site. 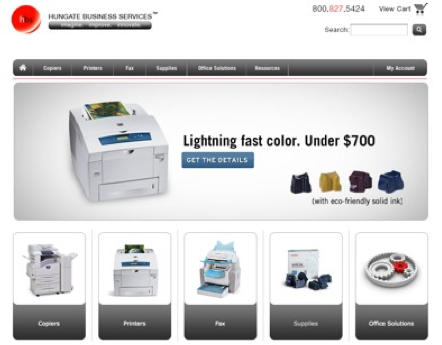 Hungate Business Services: Highrise makes adding CRM tasks "80% faster than before"
At Hungate Business Services, we sell and service office technologies. We are an independent reseller that specializes in imaging products from the likes of major manufacturers including Xerox, HP and Lexmark. We’re just a small family-owned business, but after 26 years we’ve been able to expand our services to clients all over the world. Before Highrise we used a proprietary CRM tool provided to us by our partnership from one of our suppliers. Even though the tool they provided had good information, it was complicated and cumbersome for most users. Plus to make matters more difficult, the software itself had not changed much in over 8 years - it lacked integration, flexibility and speed. Highrise has filled all of these voids. Matter of fact, after just 2 weeks of using Highrise on a trial basis we quit the previous CRM system cold turkey. Starting from scratch was a little bit of a headache, but we’ve been able to realize some tangible productivity benefits in the short term. We use Highrise to get things done. Client correspondence with our old system could take several minutes to navigate through a myriad of screens, prompts and different software to do the same things that Highrise can do in just a few seconds. We estimate that a simple sequence of locating a client, writing a note and adding a task can be done 80% faster than before! Aside from the obvious productivity increases we’ve realized, we really love the Tags and Deals functionality. The Tags save a ton of time for our salespeople when applying multiple Tags. For example, we have Tags set up by geographic area and vertical market. So if we have a sales person who wants to call on the legal market in a certain city it can be done in a flash. With thousands of contacts, Tags may be the most powerful feature of Highrise for our team. The Deals tab brings our company together in so many positive ways. We can see what's in the sales pipeline at any given time which helps us make better business decisions and allows our managers a quick overview of activity going on in our respective sales territories. Also, having the ability to assign categories is handy for inventory planning with the family of products and services that are getting more exposure. We’re very excited about the Highrise app for iPhone. Version 1.0 has been a good start for the 37signals staff, but we know it’s only going to get better. Bringing together mobility and information is critical for any sales team. With the iPhone app we’ll be able to have a contract strategy like we’ve never had before. We are also in the process of writing some scripts using the Highrise API to further integrate our business. Our goal is to connect our core accounting software and our web store into Highrise. Having a single point to see what’s going on in our business has always been a dream. Fortunately with the help of a few talented developers and straightforward API documentation from 37signals, that dream should be a reality very soon. Highrise has been a breath of fresh air for all of us at Hungate Business Services. Highrise is affordable, simple and powerful. All three of those adjectives describe what is necessary for any company in today’s market to compete and prosper. EmployFlex certifies and recognizes companies who are offering flexible work options. They certify companies as Flex-Friendly and then include them in their online Workplace Flexibility Directory and media campaign. Below, Jane Seibel, CEO/Founder of EmployFlex (pictured at left), explains how her team uses Highrise. We use it daily to track our companies that we are certifying. We work remotely and it allows us to stay really focused on servicing our companies quickly and consistently. Because of all of these reasons it was simply the best out there. We love it!!! We started with Salesforce but they had too many bells and whistles for what we needed. Any story about a situation where Highrise helped you out? Highrise helps us out daily! For example, we certified Honest Tea and so created a Deal and linked it to our email notes. As I mentioned, we work remotely and at different times of the day. Honest Tea had a question that needed to be answered and because of Highrise and the Deals functionality we can transition staff in and out of the software and keep service consistent. Love the software and find it really refreshing to use a software program that has just the right functionality to solve all our needs. Great job in knowing just what EmployFlex wants.